Sushi sushi sushi, everywhere except Manchester. Until now you could only sample this gift of the Japanese people to mankind in two locations here: The YO! Sushi treadmill in Selfridges and New Samsi on Whitworth Street, both scandalously overpriced and fairly mediocre quality-wise. Recently we got Wing's in the Arndale Foodmarket (reviewed here) and Sapporo Teppanyaki in Castlefield, which I think has the best sushi of the lot. So here comes another sushi-slinging joint. Mai Bai fills a nice little gap if you're in the vicinity of Albert Square and don't fancy soup or sarnies, it's on Princess Street just across from the Town Hall. Of course, lots of other people have this idea, and on my first visit bang in the middle of workday lunchtime the place was absolutely heaving. Come after 2:15 if you want to eat in peace. 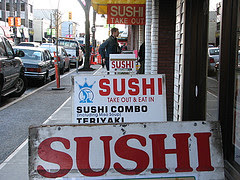 God knows why, but conventional wisdom seems to hold that the English are a tough sell on raw fish. Maybe this is why most sushi places here fill their menus with rolls made with cooked fish, and even weirder things like meat and cream cheese. Mai Bai is no different - cooked rolls easily outnumber raw fish rolls on their menu (chicken teriyaki roll, anyone? Jesus.) This saddens me. To put it plainly, if it ain't raw, it ain't sushi, except for that omlette stuff. The folks at Mai Bai seem to make most of their sushi beforehand, and sell plastic containers of the stuff in a refrigerated case. I'm told you can ask for things to be made up, even combinations they don't have on the menu, but I wouldn't like to try it when it's busy. I asked for some unagi rolls the second time I was there but they didn't have any eel in. Instead, I got a so-so California roll, which weirdly seemed to have mayonaise in it. The second time I got a very spicy kimchee roll, which was good, but in both cases I'd have preferred more filling and less rice. Both times, some miso soup and hot, in-shell edamame went down a treat. If you go that route, though, you're not going to get out of there for less than £6 or £7 if you want a drink too. I haven't tried Mai Bai's Japanese-style noodles yet, but am looking forward to it. There were quite a few people busily slurping away both times I visited. The decor is a little clinical - lots of gleaming metal and white walls, and rows of high stools and counters that make it seem like the kind of place designed for eating in a hurry, or maybe performing elective surgery. But they do have free wi-fi for customers, so you geeks might want to linger. I'll definitely be back for more Mai Bai - it's convenient, reasonably priced, and will satisfy my sushi jones. But more raw fish, please. It's all about the chicken terriaki for me, never was that much of a fan of sushi but the hot stuff there is fantastic. Reckon they'll be minted in the summer when Albert Sq's busy. Ooh, I'll have to try that. Thanks for the tip.